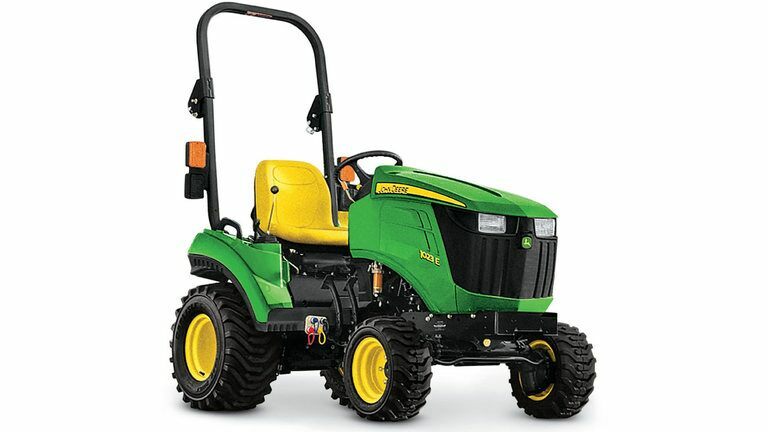 Ritchie Tractor has promotions on John Deere compact tractors. Let Ritchie Tractor get you in the right product for the right price. Our sale on sub-compact tractors from John Deere will help anyone manage their acreage, with trusted equipment that will last for years to come. Learn more about the 1023E or see more sub-compact tractors. *Offer valid on purchases made between 01 February 2019 through 30 April 2019 Subject to approved installment credit with John Deere Financial, for agricultural, consumer, or commercial use only. Up to a 20% down payment may be required. Example: based on a purchase of 1023E with 60" Deck pricing includes a sale price of $11,975, a downpayment of $1,200 financing of 0% APR is for 72 months and a payment of $149.70. 1023E with D120 Loader pricing includes a sale price of $12,171, a downpayment of $1,350 financing of 0% APR is for 72 months and a payment of $150.30. Sales made to government agencies, company direct sales or other businesses/agencies that participate in John Deere's Special Discount Program or in John Deere's Rental Business Program are not eligible. Taxes, freight, setup and delivery charges could increase monthly payment. Available at participating U.S. dealers. Prices and models may vary by dealer. Offer available on new John Deere 1 Family Sub-Compact Tractors and in the U.S. only. Prices and savings in U.S. dollars. 1Offer valid on purchases made between 01 February 2019 through 30 April 2019 Subject to approved installment credit with John Deere Financial, for agricultural, consumer, or commercial use only. Taxes, freight, setup and delivery charges could increase monthly payment. Sales made to government agencies, company direct sales or other businesses/agencies that participate in John Deere's Special Discount Program or in John Deere's Rental Business Program are not eligible. Available at participating U.S. dealers. Prices and models may vary by dealer. Offers available on new John Deere 1 Family Sub-Compact Tractors and in the U.S. only. Prices and savings in U.S. dollars.